This collection of sidetreks, encounters and meta-scenarios clocks in at 46 pages, 1 page front cover,1 page editorial, 1 page ToC, 1 page SRD, 1 page back cover, leaving us with 41 pages of content, so let’s take a look! Sometimes, passion can help overcome even a nasty failure – this was a failed IndieGoGo, but it honestly doesn’t show. It’s readily apparent that the creators believed in their book and poured their own money into this supplement, because they believed in it. It’s also a freshman offering – the first thing the company has put out, so let’s take a look at how this turned out, shall we? This is a collection of side treks, encounters and connective gaming tissue – i.e. small metaplots you can insert between adventures. The respective encounters and adventures do come with flavorful read-aloud text and mimic, in font and presentation, the official Goodman Games supplements. The maps, if featured, are isometric and pretty damn solid, particularly considering the genesis of this supplement. On the downside, some of the maps, particularly those depicting natural environments, tend to lack a square grid, which makes determining positions and dimensions not always as easy as it should be. I will thoroughly spoil the content of all of the material herein in my discussion below, so if you plan on playing these as a player, stop reading NOW. From here on out, the SPOILERS rule! All right, only judges around? Great! -“In the Prison of the Squid Sorcerer” by Ken Jelink: Intended for low levels (1st level), this encounter for low levels kicks off with a bang, as a superior hydra of pure water attacks the PC’s seafaring vessel. Rescued by pirates of dubious repute, the PCs are roped into researching a Cthulhu-cultist/wizard imprisoned…said cultist is related to the local lord, and the prison is a brief mini-dungeon, where coral oubliettes and a brutish mauler loom – and betrayal is afoot. I liked the premise here, and the execution isn’t bad either, but this one would have worked much better as a full-length module that allows the mythos components and the unique backdrop of the dungeon to shine. -“Mermaids from Yuggoth” by Daniel J. Bishop: Also intended for low levels (level 2 – 3, though), this one is really interesting in that it’s one of the meta-narrative encounter collections within; it is based on the PCs assuming control of an ostensibly haunted and abandoned manor. As they get to know the local populace and their home, slowly but surely the weird and unsettling is settling in, spanning, ideally, multiple adventures and weeks in the meantime between escalations. Add to that the unique monster (and the lavish and utterly alien b/w-illustration), and we have a true winner that is more efficient in conveying the feeling of a traditional mythos-story than many CoC adventures. Two thumbs up! -“Shadows of Malagok”, penned by Jon Wilson, is intended for mid-level characters (5th level is suggested), and represents a slightly expanded swamp wilderness encounter that have the PCs find a shrine of Malagok and face the eponymous shadow as well as the servants. Okay, if not outstanding. -“Swindled at the Laughing Harpy” by Paul Wolfe can theoretically be run for any levels, though low level PCs will probably have to run at one point. This encounter focuses on grafters attempting to swindle the PCs – where once they did so out of greed, they have now been enslaved by an insidious artifact tied to the horrid entity known as “The Painted Woman.” This is a fun little encounter that sets the PCs well up to “Quest for It”, as any judge worth their salt can craft a unique angle from the aftermath. -“Slaves of the Visitants” by John Humphrey comes with a nice isometric map of the escape room-like basement, in which the encounter takes place. It is also a puzzle-counter, though one that requires a bit of work to translate to other languages, in case you’re not running this one in English. I’d consider this to be a solid encounter, though one that that could have used a tad bit more depth and complications. -“Sails Aflame!” by Jon Wilson is as straight-forward a low-to mid-level encounter as can be: The PCs are on a ship, when basically a ginormous burning beetle that makes a nest out of flotsam attacks the vessel! It’s a great way to wreck a ship, a unique critter and a truly deadly adversary for low level PCs, intentionally beyond their easy means to defeat. Unique, fun, to the point – and all on a single page! Two thumbs up. 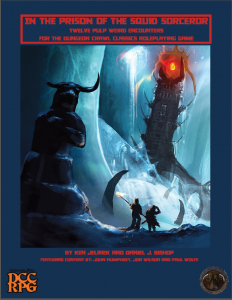 -“Caves of the Ice Mistress” by Ken Jelinek is crafted for level 5 characters, and is a fun little 3-room ice-themed mini-dungeon, with an Appendix N-style ice spider theme. Per se nice, the third room of the isometric dungeon map is a bit hard to grasp, a fact exacerbated by aforementioned lack of a grid on the maps. -“The Long Sleep” by Ken Jelinek is a pretty straight-forward mini-dungeon funnel, wherein the undertaker has gone missing, requiring stouthearted folks to investigate. They are bound to find more than they bargained for. This one is nice, particularly if you want to start a bit more low key to have room to build up material in the future. -Paul Wolfe’s up next, with “The Cult of the Flickering Sign”, intended for level 3 characters, is pretty cool – aforementioned sign is reproduced in the book, and while happening upon the cult and wrecking their party’s pretty simple, it’s a great way for the judge to kick off a longer adventure by lacing in the storyline of the sign. Efficient, neat, like it. -“Another Man’s Treasure”, intended for low level characters, can be somewhat fatal for 0-level characters, and focuses on an interesting, cursed magical item. Big kudos: Via logic and observation, the PCs actually can deduce the parameters of how it works. Like it! -“The Nazhghad’s Invocation” by Paul Wolfe is basically about the PCs stumbling into a spell duel between two factions of equally vile entities and their servants. Solid if you need to establish a conflict between factions, but otherwise not an encounter that grabbed my attention. A round by round breakdown of the spell duel is nice to see, though. -“Icon of the Blood Goddess” can be started as soon as level 0 or level 1, but the main draw will probably require at least level 3 for the finale. It is penned by Daniel J. Bishop, and is the second of the linked meta-encounters that can provide a narrative framework between modules. The PCs pass an alley, where they can see a gaunt statue – over the course of multiple adventures, the believers in the statue and the offerings left will increase, as the malign blood goddess, growing ever more monstrous in appearance, draws in more and more adherents, escalating the danger…that can only be stopped by entering her realm, where a deadly puzzle combat, including unique spellcasting side-effect table and spellburn side effects are included. This one is a resounding success and is well worth my seal of approval when judged on its own! Editing and formatting are good on a formal and rules-language level – I noticed a couple of minor glitches, but not enough to sink this supplement. Layout adheres to the classic two-column b/w-standard you know from Goodman Games’ offerings, down to the font. The b/w-artworks similarly mirror Goodman Games’ aesthetics, and while the isometric maps don’t always live up to that exceedingly high standard, they still exceed what you’d expect from this project. The pdf comes fully bookmarked, with one bookmark for each encounter. This collection of encounters penned by Paul Wolfe, Ken Jelinek, Daniel J. Bishop, Jon Wilson and John Humphrey feels like a passion project, in the good way. It is a nice means for the judge to bridge “big” adventures, and while some of the encounters left me rather less impressed, many actually go beyond the call of duty. In particular the two meta-encounters that span multiple sessions penned by Daniel J. Bishop represent glorious additions, and frankly, I’d love to see more of those, regardless of system. You know, little sidestories that you can easily and painlessly weave into ongoing campaigns. These two, at least for me, warrant the fair asking price on their own, and both should be considered to be pretty much 5 star + seal material. I do have to judge the collection on its own, though, and it does have a few rough spots here and there, which is why my final verdict will clock in at 3.5 stars, though with a definite rounding up here; this is worth getting, and represents a fun and handy kit to have. You can get this collection of encounters/side-quests here on OBS!